From praise for loyalty to vilification for a change of mind - Fabian Delph's move from Aston Villa to Manchester City has found a place in the all-time transfer sagas scrapbook. Only a few days after publicly stating he was committing his future to Villa, having been on the brink of joining City, he has made an almighty U-turn and joined Manuel Pellegrini's side. Having featured in an Aston Villa tweet promoting next season's new kit earlier in the day, the BBC and several other media outlets learned that the England midfielder was set to have a medical at Manchester City. The North West club had triggered the £8m release clause. Some football followers keenly pointed out Delph's comments when he signed a new four-and-a-half year contract with Villa in January. Although some questioned his decision to turn down a move to a "bigger" club, other football fans, like Arsenal supporter Steven Parkhill, praised the decision to stay put. So all was good and well at Villa. Delph flew out to join the rest of his team-mates at the Portugal training camp. It was a squad that had been strengthened by the signings of English full-back Micah Richards and midfielders Scott Sinclair and Idrissa Gueye. Belgium striker Christian Benteke, who was then reported to be a target of Liverpool, also travelled with the club. Villa manager Tim Sherwood said: "I knew there was interest from Manchester City and few other clubs who had shown a lot of interest in Fabian as I expected for such a small fee on the buyout clause. Tim probably had, before BBC Sport's David Ornstein, confirmed that Delph's £8m move to City was back on. This news came a few hours after it was reported Liverpool had met a £32.5m release clause for Benteke. 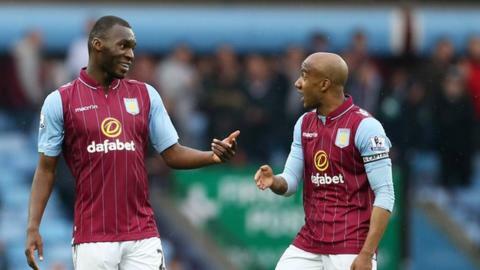 It is understood Delph had informed club owner Randy Lerner of his latest decision on Thursday. Understandably, the reaction from Villa fans ranged from disappointment from that which was slightly more vitriolic, with a dash of humour.